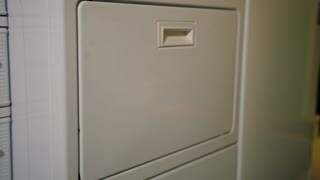 A man removes clothes from a drier. Shallow DOF. Shot at 60fps. Workers at the service station is further processed edge vinyl special dryer. 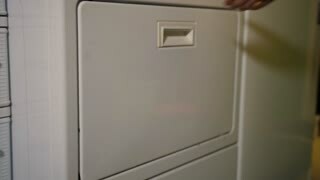 A man puts a load of laundry in the drier. Shallow DOF. Shot at 60fps. Close-up of male hands drying long female hair using electrical drier. Beauty saloon. Slow motion. 100 fps. Charming young red-haired woman dries the hair dryer her long hair, sitting on the bed in the bedroom. Supermarket consumer electronics, the department of electric hair dryers for hair drying. A set of studs and rubber bands on the table at the hairdresser. A young girl dries her hair in a hairdresser with a professional hair dryer. Portrait of a young woman in a Barber shop. 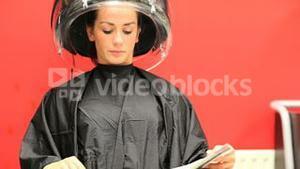 A young woman is sitting in a hairdressing salon in a chair and hot air is blowing on her hair. Modern treatment and hair care. Close-up of a hairdresser switching on a modern professional hair dryer in a modern hair salon. Close-up of professional hair dryer dries young girl's hair. Portrait of a girl in a beauty salon. The procedure of moisturizing hair mask in a professional hair salon. Clothes on drying rack stand. Wet washed laundry on clothes airer. Indoor shot.